Spring rolls are one of my favorite summer snacks/meals. They're healthy, fresh, tasty and pretty! 1. Dipping Sauce: Combine ingredients and add 1/4 cup of warm water, whisk until smooth and refrigerate. 2. Spring Rolls: Bring a pot of salted water to a boil, then remove from heat and add shrimp. Allow to cook for about 2 minutes until shrimp turn pink. 3. Remove shrimp (reserving water) and allow to cool. Return water to a boil and cook rice noodles according to package directions. 4. Slice shrimp in half lengthwise. Rinse and drain rice noodles. 5. Fill a medium size skillet about half way with cold water. Immerse 1 sheet of rice paper into water about 5 seconds, paper should still feel a little stiff but it will soften as you roll. 6. Lay 4 shrimp (halves) in a row. 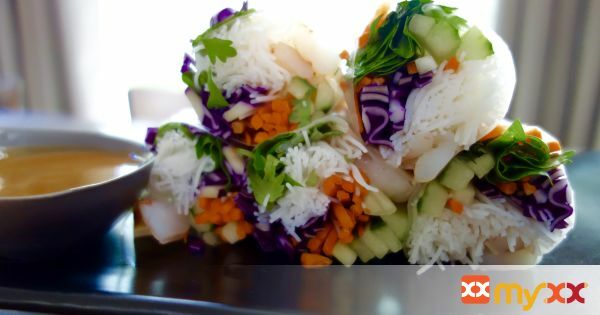 Top with 1 oz of rice noodles, shredded carrots, shredded cabbage, cucumbers, spring mix, cilantro and mint leaves. 7. Roll rice paper with filling like a burrito. Repeat until all ingredients are used. Serve with dipping sauce.